Gorgeous and Classic Tiffany & Co Heart Key Charm Features: -18k Yellow Gold (750) -1.1 Inches x .4 Inches (at widest part of heart) -Stamped Tiffany&Co 18k -100% Authentic Guaranteed This is a beautiful pendant that may be added to any necklace (the key to your heart!). I have had it for a while and it only has a few minor surface scratches which are only noticeable upon close inspection, and could be polished by a jeweler. A classic signature Tiffany piece. Please e-mail me with any questions or for more photos. Thanks! TIFFANY & CO. STAMPED TIFFANY & CO AU 750. YELLOW GOLD. LOT#6096TM. Ending Apr 22 at 4:37PM PDT1d 18hMetal: Yellow GoldTheme: Love & HeartsBrand: Tiffany & Co.
Tiffany & Co. 14kt Yellow Gold Jack in the Box Black White Enamel Charm EXTREMELY RARE. This is a very rare vintage charm from Tiffany. It is 14 yellow gold. This charm is spring loaded and has black and white enamel. Marked on the bottom as you can see from the pictures. Please feel free to message me with any questions. Thank you. Tiffany & Co. Gold Pendant. Base of key and the bails are crafted in fine 14k yellow gold with a polished finish. Key is uncut and is made of brass. Weighs 10.1 grams. Platinum Bullion. Gold Bullion. Silver Bullion. 267 South Central Ave. Signed Elsa Pertti 750 Spain. This is an as-is item. Situations where item is not as described will be handled on an individual basis. Authentic Tiffany & Co 20mm 18k Yellow Gold Heart Tag Charm Pendant With Pouch! In excellent preowned condition, few hairline scratches very easy to polish off. It’s about 20mm tall x 17mm wide. I'll be more than happy to help. In amazing pre loved condition. Hallmarks as pictured. Theme: Love & HeartsBrand: Tiffany & Co. Probably could use a polish but looks new. See photo. No longer have Tiffany box and bow. The don’t make this combination anymore, particularly with this chain length so a great unique gift. Tiffany & Co Return to Tiffany small round tag pendant necklace - this is a rare and retired piece. **The heart edition sells for $875 currently** It's in very good condition with some light surface scratches. I’ve had it cleaned but not polished. I didn’t want any metal loss. The pendant size is small, 5/8" across on an 18" chain T&Co 18kt Gold chain. The chain and round charm are hallmarked Tiffany & Co and 750 which means 18 carat gold. Authentic Tiffany Co 18k Rose Gold Oval Key Charm Pendant For Necklace-new!!! You are looking at a 100% Authentic Tiffany & Co 18K rose gold 1.25" Oval key pendent. TIFFANY & Co. TIFFANY & Co. for unique & fine jewelry & accessories. Always see photos & form your own opinion. Ready to Engrave on the Reverse Side if Desired. Double your traffic. Ready to Wear or Gift! Beautifully designed, this charm is both simple and elegant. Made from solid 18k yellow gold, the key is marked T&Co 750. If there is no certification listed, then the grade/cut/color of the diamond is based upon our own appraisal from our GD Certified Personnel. In great preowned condition, show normal sign of use. It’s about 20mm tall x 17mm wide. I'll be more than happy to help. Like New and Excellent Condition. Professionally Polished. Tiffany & Co. 100% Original Tiffany & Co. Material 18K Yellow Gold. Important Notes. Authentic Tiffany Co 18k Rose Gold Oval Key Charm Pendant For Necklace!!! You are looking at a 100% Authentic Tiffany & Co 18K rose gold 1.25" Oval key pendent. Its in mint condition, have no scratches. Authentic Tiffany & Co pendant, the pendant crafted in 18k yellow gold with a polished finish and has a double side crescent moon inside an open circle with a diamond in each eye of the man face moon. The style is classic Tiffany, making it a piece that you will most certainly use over and over again. Great piece to wear to work, or for just going to dinner with friends in jeans or a pretty dress. Theme: Love & HeartsLength: 16 - 17.99"
Tiffany & Co. 18K Yellow Gold Angel Cherub Charm Pendant Chain Necklace 16"
Up for your consideration is a beautiful, Authentic Tiffany & Co. 18K Yellow Gold Angel Necklace. The Necklace has a total weight of 9.0 grams. Blue Pouch & Box. We look forward to hearing from you soon! Tiffany & Co. 18K Yellow Gold Open Heart Pendant Charm Chain Necklace 16"
Up for your consideration is a beautiful, Authentic Tiffany & Co. 18K Yellow Gold Heart Necklace. The Necklace has a total weight of 5.1 grams. Blue Box and Pouch. We look forward to hearing from you soon! For sale is a Tiffany & Co. Elsa Peretti 18k Yellow Gold Large Open Heart Charm Pendant. It is in very good condition with light wear from normal use. Pictures are of the actual item you are buying. Style: PendantLength: Less than 13"
Tiffany & co. 18k Gold apple charm designed by Elsa peretti. Perfect for any Tiffany lover, great present for the educator / teacher / professor in your life. See last photo for size. Option to upgrade to priority for a fee. Weight: 27.3 grams. Length: 7" Long. Theme: Love & HeartsLength: Less than 13"
In excellent pre owned condition ready for engraving or wear. “LOCAL PICK UP IS ACCEPTED AND REQUIRES. With pouch no box. in operation since 1923. Tiffany & Co. 100% Original Tiffany & Co. Material 18K Yellow Gold. Important Notes. The chain is 16" long and hallmarked "Tiffany & Co. 750". The Heart is size Small 20 X 16 mm (3/4" X 5/8") and signed "Tiffany & Co. 750". Excellent condition. Heart Charm Pendant Necklace 16". 18K Yellow Gold. Authentic Tiffany & Co Pendant. Tiffany & Co Pouch is Included. Purity: 750 or 18K. Ticket Number: 0298. Composition Material. Tiffany & Co. Peretti Fancy Puffed Curved Charms Necklace in 18k Yellow Gold. This lovely charm necklace is from Tiffany & Co. by designer Elsa Peretti. It is crafted from solid 18k yellow gold in a fine polished finish and has seven puffed style curved S shape charms including the clasp, they are set 1.75" apart along the entire length of the chain. The item you are looking at is a beautiful Tiffany & Co. Elsa Peretti 18k Yellow Gold Large Open Heart Charm Pendant. Condition: Pre-owned but in great condition. Handling cost for this item is Free! Tiffany & Co. Notes alphabet letter G charm pendant in 18K yellow gold. The net weight is 3.0g/2.0dwt. Chain not included. We try to fully photograph each item, the photos are to be used as the item condition unless otherwise noted. Tiffany & Co. Four Leaf Clover charm and chain in 18K yellow gold. The beaded chain is 18 inches long. The items are in excellent condition with normal signs of wear. Will include Tiffany & Co. little box. Will be shipped fully insured. Please contact me if you have any questions. Returns Policy Buyer can return the items within 14 days for money back. He/she pays the return shipping and will not be refunded by the seller. The exception is if the items are not as described. The buyer will be responsible for any loss of or damage to the items during their possession and return shipping. Thank you. 18k Tiffany & Co. Best Ever New York City Gold And Diamond Pendent Charm Rare!!! Tiffany & Co. Best Ever New York City Gold Charm. Condition is Pre-owned. Sum pictures are before it was cleaned that’s why there is a color difference pictures do not do it justice it is a stunning piece of art. Tiffany & Co 18k 750 Y Gold Silver Necklace Heart X Kiss Charm 18" L 6.0 gr. 100% Authentic Tiffany & Co. Heart Pendant Necklace. Its fully hallmark stamped as shown on pictures. Gold /Sterling Silver. Spring Ring. 18" L (w/ pendant). 12 mm x 12 mm. Make sure you check out our great deal. TIFFANY & CO 18K Yellow Gold Heart Tag Charm in Gold Chain Necklace,Chain 16"
Tiffany & Co. Accessories With Tiffany Pouch and Box. "TIFFANY & CO. 750". 100% Original Tiffany & Co. Like New and Excellent Condition. Professionally Polished. This simple charm can be perfectly personalized with engraving. Add a personal touch to your Tiffany design with this whimsical charm. Metal: Yellow GoldStyle: PendantBrand: Tiffany & Co.
Tiffany & Co. 18K Yellow Gold Cross Charm Pendant Chain Necklace 18"
Up for your consideration is a beautiful, Authentic Tiffany & Co. 18K Yellow Gold Cross Pendant Necklace. This necklace has a total weight of 6.1 grams. Blue Pouch and Box. We look forward to hearing from you soon! Notes 18K Yellow Gold Engraved Initial "U" Disc Charm Pendant. This 100% authentic Tiffany & Co. charm/pendant is from "Notes" collection and crafted in solid 18k yellow gold. The pendant features lovely disc design of beautiful high-polished finish and is engraved with the initial "U" at its center. Tiffany & Co. Elsa Peretti 18k Yellow Gold Saxophone Charm Pendant Circa 1984. Signature: 1984 / Tiffany & Co. / Elsa Peretti / 18k. Truly a great piece at a great price! 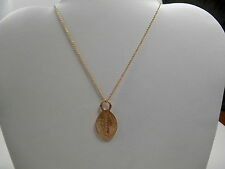 Beautiful Authentic Tiffany & Co. 18K Yellow Gold Twist Oval Key Pendant Necklace in excellent condition. Tiffany & Co. The chain is 1mm thick, 18" long, hallmarked "Tiffany & Co 750". Twist Oval Key. Tiffany & Co. "Mom" Heart. Yellow Gold. We are not able to change the invoice price for any reason. Item Style Item Weight. The chain is 16 1/2" in length. The chain and charm have been professionally cleaned and look new. Family owned and operated since 1990. as described and pictured. Jacksonville, Florida 32211. I will be happy to resolve any issue. Metal: Yellow GoldStyle: ChainBrand: Tiffany & Co.
Tiffany & Co. "Tiffany & Co. AU750" on key and clasp. 1.5" Oval Key Pendant w/Box, Pouch, Ribbon. 18K Yellow Gold. on a 16.5" gold chain. 16.5" Chain. Wonderful present for yourself or anyone you love! I AM A GRADUATE GEMOLOGIST SCHOOLED AT THE G.I.A. SO BE ASSURED YOU ARE GETTING AN ACCURATE EVALUATION.